Pieces like the example in this photo were shown in the London Science Museum, UK, on Oct. 15 where international experts presented the world’s largest metal 3D-printing project, lead by ESA and the EU. AMAZE – Additive Manufacturing Aiming Towards Zero Waste and Efficient Production of High-Tech Metal Products – involves 28 industrial partners across Europe. 3D printing builds a solid object from a series of layers, each one printed on top of the last. This ‘additive manufacturing’ technique produces very complex structures with minimal waste and maximum flexibility. The European Space Agency has rolled out a new initiative to refine 3D printing techniques to make space-grade metal parts. The project, called AMAZE, aims to spur innovations that could one day allow astronauts to print their own metal tools aboard the International Space Station or let engineers on the ground to print entire satellites. Billed as the world's largest metal 3D-printing project, ESA's initiative brings together 28 industrial partners across the continent. 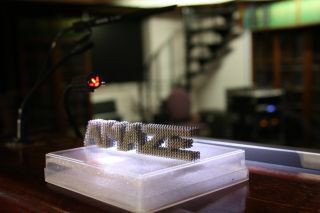 AMAZE is short for Additive Manufacturing Aiming Towards Zero Waste and Efficient Production of High-Tech Metal Products. "We want to build the best quality metal products ever made," David Jarvis, ESA's Head of New Materials and Energy Research, said in a statement when the project was unveiled last week at the London Science Museum. The group is focusing on making space-quality components by using lasers, electron beams and even plasma to melt metal alloys, Jarvis explained. The project also aims to explore the possibility of combining strong and lightweight, but more exotic metals, such as tungsten, niobium and platinum, though these materials are expensive. As part of the initiative, four pilot 3D printing-factories are being established in Germany, Italy, Norway and the United Kingdom. David wants to help standardize the technique and bring it to the mainstream, connecting key players in the metallic 3D printing business to develop a supply chain. ESA officials say innovations along the way to make 3D printers more viable for spacecraft could have benefits on Earth, leading to improvements in aircraft wings, jet engines and automotive systems. ESA is hardly alone in its ambition to perfect metal 3D printing for the final frontier. Among several other NASA endeavors in additive manufacturing, the U.S. space agency recently completed a successful hot-fire test of the biggest 3D-printed rocket part built to date: an engine injector printed with nickel-chromium alloy powder. There are several private and university-led efforts, too. Earlier this month, a group of students at the University of California, San Diego performed their first test of a 3D-printed engine made from cobalt chromium.